I discovered meat pies on the family trip to London two years ago. Our visit to the Tower of London included lunch, and, in the spirit of the adventure, I ordered a beef and ale pie. It was a pastry shell about four inches around and three inches high, wrapped around a rich, almost bourguignon-esque filling. It was so good I ordered it again when we visited Hampton Court, which was provisioned by the same food service. 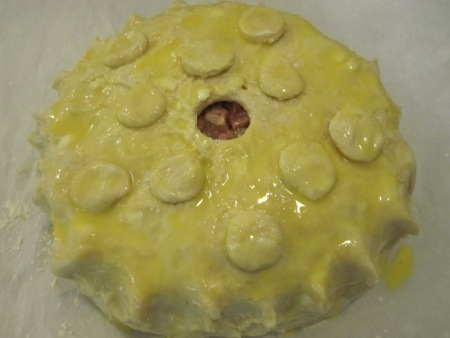 This month’s Charcutepalooza challenge was “packing,” either pâté en croute or English pork pie. Guess which I chose. I’ve had mixed results with pie dough, but my most recent attempt was a success, so I hoped I could build on my experience by making a fully-encased pie. I used the recipe in Charcuterie, but made some technique and ingredient substitutions of my own. And I had the previously-documented expertise of She Who Must Be Obeyed to fall back on if things started to go pear-shaped. 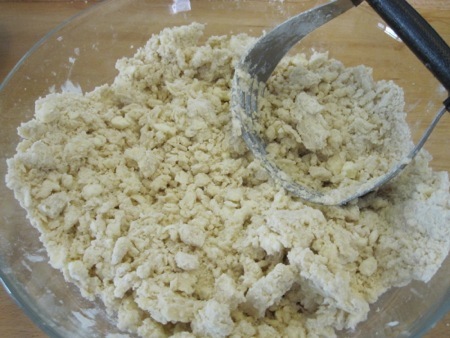 Rather than use my fingers to combine the flour and fat, I used a dough blender that I had chilled in the freezer. 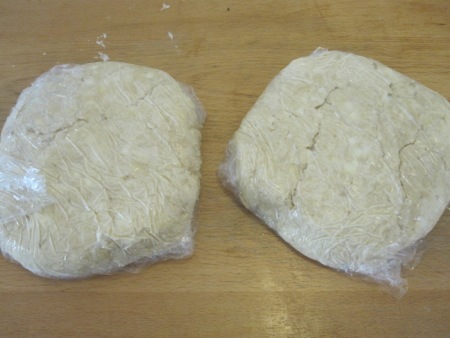 With the fat incorporated (a possible name for my proposed catering business), I mixed in the egg and water, divided the dough in half, and wrapped each piece in plastic. She Who assured me that the visible chunks of butter and fat would ensure a flaky crust. 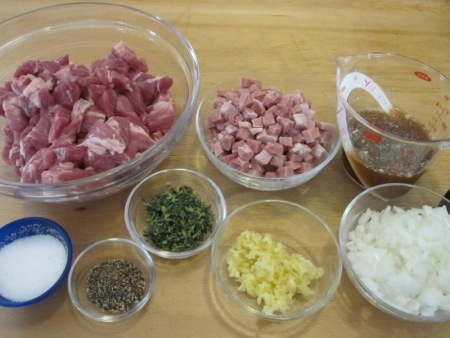 While the dough chilled in the fridge I turned my attention to the filling, which was pork shoulder cut into one-inch cubes, smoked ham cut into quarter-inch dice, salt, pepper, thyme, minced garlic, finely diced onion, and ramen broth. Although the recipe calls for chicken stock, I figured the pork-based ramen broth would add depth and some gelatin to the filling. I sweated the onion and garlic, ground the pork and seasonings through the small die of my grinder, and when everything was cold I mixed the filling, slowly adding the broth and then the ham until the components were evenly combined. I let the filling chill, then returned to the dough. I knew it would be soft and sticky, so I got clever and rolled it out on floured parchment paper instead of my countertop. 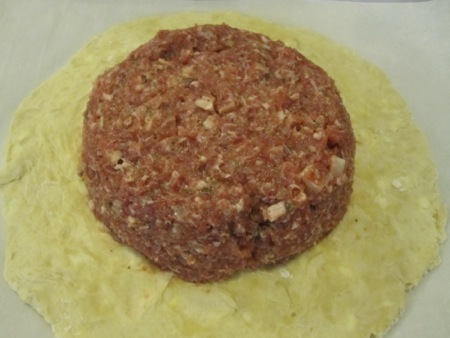 Once I had a twelve-inch disc of dough, I molded the filling into the center, shaping it to be about five inches in diameter. To compensate for the lack of overlap, I cut a larger circle of dough for the top – about seven inches – and cut a vent hole in the center. I coated one of the sides with egg wash, placed it wash side down on top of the filling, and crimped it around the edges to seal the pie. I cut some extra bits of dough and arranged them around the top before applying another coating of egg wash.
At this point the pie looked pretty good: round, a bit squat, but with straight sides and some decorative flourishes. I don’t know why I thought it would retain that shape once it hit the oven, which would cause the fat – the only thing providing structural integrity – to melt. And melt it did, into a dome-shaped finished product. After an overnight rest in the fridge, I let the pie sit at room temperature for a few hours before cutting into it. As you can see, there was plenty of space between the crust and filling for aspic. When (not if ) I make this pie again, I’ll either scoop out a bit of the filling from the vent hole, or leave the cutter in the hole to provident it from clogging. I cut the aspic-less pie into thick wedges and served them with a simple parsley salad to provide brightness and acidity. She Who and He Who Will Not Be Ignored added a healthy glob of whole-grain mustard as an additional accompaniment. He Who expressed some doubts about eating “meatloaf pie,” but he was surprised by both the texture and flavor of the filling. It had the coarseness of a country pâté with textural variety provided by the ham, and a rich, porky flavor. A little of this pie goes a long way because it’s so hearty, but we’re looking forward to eating the leftovers. When I make this again I will probably try to mold it into a soufflé dish in the hope of producing the straight-sided pie that I think of as the ideal meat-encasement vehicle. Until then, I think I can force myself to eat this version again. This entry was posted in Uncategorized and tagged charcutepalooza, cooking, food, pig. Bookmark the permalink. Nice pie, Mr. Belm! I had similar issues with my vent hole getting clogged with juices and such, so once the pie cooled, I very very carefully lifted the top crust away from the dome of meat with a thin wooden skewer while simultaneously pouring warmed meat jelly very slowly into the pie through a funnel. It went extremely well despite feeling Very Risky. When I make the pie again I’l probably just scoop out the filling that collected around the vent hole, doing it while the pie is still hot. That would give me enough room to add the aspic. It sounds like a very big and complicated challenge. I think this pie looks great. 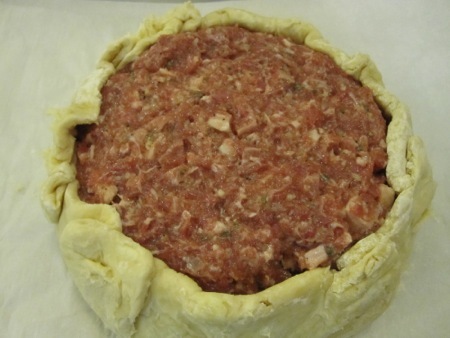 I have also had “space” problems when trying to make french tourtes (covered tarts) with meat. 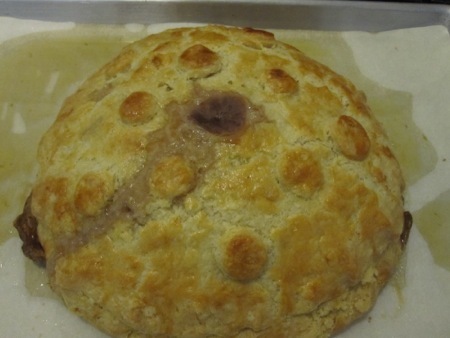 On the other hand I have recently made a chicken pie and it was perfect… Still don’t know why. My guess is that the filling for the chicken pie had more moisture than a meat pie filling. More steam escaped from the chicken filling, which lifted the crust during the early stages of the baking, not unlike the initial “oven spring” you get when baking bread. I guess I hadn’t fully realised that meat pies aren’t part of the US culture – they’re so central to British, especially northern English, food. And yes, a good pork pie (and I’m quite certain yours was, despite shaping and jellylessness) is one of the great high points of English cuisine. 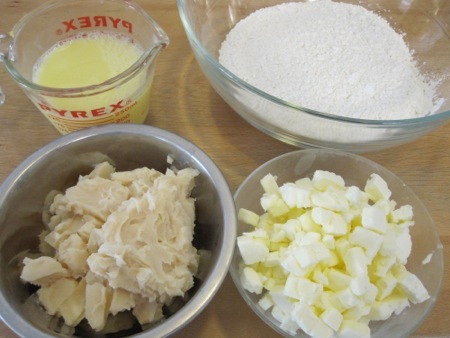 The chicken pot pie is very common in the States, bt other meat pies are almost unheard of. 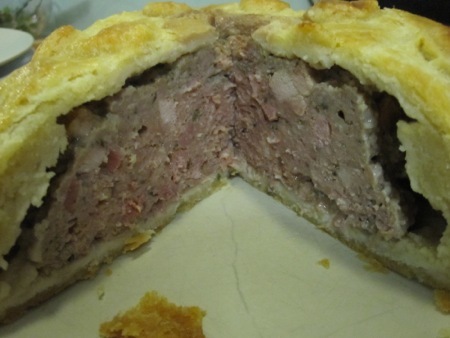 I like to pork pies, and have made more than one pheasant and trotter pie as well. I don’t know if it’s just me, but every time I read your blog I have a desire to raid your splendid freezer. Keep the good food coming! I just finished an inventory of the Deep Storage Facility. I have many meals already planed out.